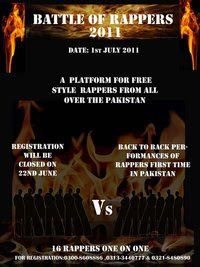 For the first time in Pakistan a platform for free style rappers from all over the place. A golden chance for all the rappers to prove their talent. DON"T MISS OUT THIS ONCE IN A LIFETIME OPPORTUNITY !! A NIGHT OF MAYHEM !! ONE VENUE !! ONE NIGHT !! & ONLY ONE PLACE TO BE !! !